We welcome you to stay with us at our hostel-style bunkhouse! Here you can kick back and relax after your long day outdoors! The bunkhouse is an open-concept community bunkroom where you can tell the tales of your epic adventure with other outdoor enthusiasts, relax by the stove, and of course stay the night with minimal cash. 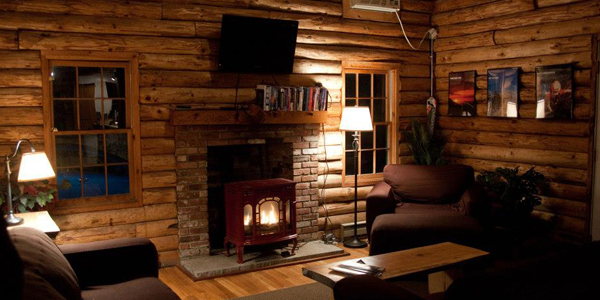 We understand how tough it is to find affordable lodging in a tourist area… the NEM bunkhouse fills that gap! Come check us out and we know you’ll be back time and again. For your convenience, we have a flexible check in policy. You are welcome as long as you arrive before 10pm and clear out before the next group arrives! We are located at 1054 NH 16 Bartlett, NH. The address does not work well in GPS or online mapping. Instead get directions to Storyland, Glen, NH and continue North on Rt. 16 for 1 mile. We are a log cabin across the street from the Glen Ledge Gas Station. You will pay when you check in. We accept cash, credit, or check.